Mr Loadlink assesses the England football team’s successful Group B campaign at the ultimately doomed European Championships, reflects on Vertikal Days and welcomes a load cell maven. Pizza boxes were sent flying and drinks were spilt. It was 3:45pm on a Thursday afternoon and pandemonium ensued in the Straightpoint boardroom at Havant headquarters here in Hampshire, UK. The tension had been broken. Just when it looked like another false dawn, the net rippled, sparking wild scenes of jubilation. I may have already lost readers who aren’t football (soccer) fans. It was England’s second group game in the European Championships and we’d just scored a last-gasp winner to defeat neighbours Wales in what was billed the Battle of Britain. Stick with me because there is, as always, a business point to make here. But first let’s relive that magical moment. It was more about perseverance and belief than brilliance. England had possession on the edge of the Wales penalty area. The ball found its way to Daniel Sturridge on the left hand side of the box and he shaped towards the near post. Despite the close attention of Wales defenders and a last-ditch sliding tackle, Sturridge fired the ball low past the goalkeeper. It was so late in the game, it was safe to celebrate it like a certain match-winner—and we did! Prior to that, our goalkeeper, Joe Hart, had effectively pushed a speculative long-range free-kick from Gareth Bale into his own goal to give us a mountain to climb having already dropped points in our opening game against Russia. Substitute Jamie Vardy had levelled proceedings before the late drama unfolded. England eventually limped into the last 16 of the competition when a goalless draw against Slovakia four days later saw us finish runners-up in the group, ironically behind Wales who stuffed the Russians on the same night. Let’s not go into what happened next. What’s all that got to do with business? Well, many CEOs and company leaders curse summer sporting events. They see football World Cups, the Wimbledon tennis championships, Olympic Games and other extravaganzas as a distraction. They think it’s bad for business that people follow live scores and send emails about it being expected that employees will use annual leave, not company time, to watch their heroes and national icons. Consider what happens when an employee reads such a message. They turn to the person next to them and scoff about the boss. They spend the next 30 minutes talking about how unreasonable it is before forwarding it onto a colleague and friend with a message containing a few asterisks so the bad language is not detected by the email police. People talk about the archaic policy in tea rooms, over lunch and in the pub after work. They tell their parents, siblings, sports teammates and anyone else who’ll listen. The negativity spreads like wildfire. Imagine the damage that does to company morale and team spirit. I’m not in search of the boss of the year award. Truth is I love football and had an interest in the game myself. But I wanted to give my staff the opportunity to talk positively about a big game at a tournament that clashed with working hours. 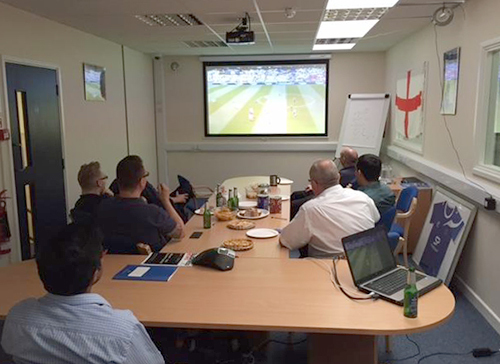 Instead of making people take time off, we put the game on the big screen in the boardroom, ordered in some food and invited those interested to take a couple of hours off and cheer on the boys together. I think everyone appreciated the gesture. Again, I’m not looking for adulation, but I hope employees did tell their families and friends how we accommodated the game. I think more business leaders should consider the positive impact such events can have. I certainly detected added vigour to people’s work that afternoon and a spring in their step when they reported for duty again the following morning. Ok, that probably had more to do with Vardy, Sturridge and co than me but you get my point. I was glad I could share the winning moment with Team Straightpoint. That morning, I had woken up 250 miles northwest of headquarters in Liverpool, where I attended the Vertikal Days show, hosted by Vertikal, the publisher of Cranes & Access magazine and its German sister title, Kran & Bühne. The annual two-day crane, access and telehandler event celebrated its 10th anniversary at the famous Haydock Park racecourse. I wanted to hit the road early on the second day to watch the England match so I planned accordingly. The event is known for its social event at the end of day one, where entertainment, food and beverages accompany networking among lifting industry professionals. My itinerary straddled the two days so I could partake in the festivities, where it was good to catch up with Modulift and LEEA in addition to lifting, transport and storage specialist Rapid Response Solutions. It was great to interact away from the formalities of the expo. We spend a lot of time on trade show stands and in meeting rooms, but often more mileage can be gained and better friendships forged over a drink in a social environment. Vertikal Days (or nights) proved that again. The journey north incorporated lunch with Dave Mullard, our business development manager and last month’s guest blogger, as many of you would have read. I enjoyed reading his blog, particularly his references to the importance of effective communication, growing our distributor network and the Breakbulk Business Run. For some reason, I think it’s the first time running around a city has been referenced in a Mr Loadlink blog! As Dave explained in his well-written piece, I have spent much of my time of late working with Roshan Divakaran, our design engineer, and the team on our expanded range of ATEX products, all of which conform to a new directive (2014/34/EU) effective this spring. Following the launch of the ATEX and IECEx version of our most popular product, the Radiolink plus wireless load cell, at the turn of the year, we’ve followed it with a new wireless Handheld Plus, compression cells, shackle cells, load pins and the Running Line Dynamometer. It’s worth reiterating that they all boast classification in Zone 0, 1 and 2 hazardous areas. One of our recent goals has been to add more products to our catalogue and the new explosion proof kit will be the icing on the cake when we send out the latest versions. The bumper edition will hit distributors’ doormats with a resounding thud, which is down to the ongoing hard work and commitment of Roshan and his team. We are meticulous planners here at Straightpoint. Roshan’s work with the Sira Certification Service, an independent certification body, on the ATEX product range is an example of that, as are our yearly and quarterly plans. However, sometimes in business one has to be spontaneous. It’s one thing to go into a fight with a strategy to work behind the jab and break down an opponent, but if they let their left hand drop, instinct takes over and the right fist comes over the top to connect with the open chin. There’s another sporting analogy for you! Such was the case this month when it became apparent to me that there was an opportunity to introduce one of the lifting industry’s biggest punchers to the company. My public relations consultants always tell me to stick to the key details and let the facts do the talking, particularly when we’re communicating with trade magazine editors. Who, What, When, Where, Why, How, they say to me every time we meet. But they’ll forgive me for further embellishment in my own blog, particularly given the importance of the acquisition. 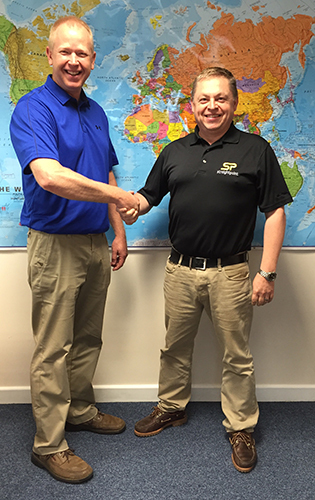 I am delighted, thrilled, proud and honoured to announce that force measurement, load monitoring and suspended weighing load cell industry veteran Wayne Wille has joined our already star-studded North American team as technical sales manager. Wayne brings over 20 years of relevant experience to our company and he could catapult our U.S. subsidiary to a new level. It’s not important where he come from—anyone who’s anyone in the industry already knows that—but the fact he now has the industry’s broadest product portfolio at his disposal is going to open so many doors for us. As I touched upon in the press release we circulated confirming the appointment, while it’s important to seize opportunity and let spontaneity rule at times, one constantly has to act with caution. Imagine if the boxer in the fight dropped his hand by way of deceit, for example. What if they’d drawn the attacking move only to counter with more dominant force of their own? In business terms, what if a company couldn’t sustain the demand or interest generated by a landmark appointment such as Wayne’s? It’s worth thinking about next time such a situation is presented to readers of this blog responsible for such decision making. In the wake of an uptick in demand, particularly for products that we offer industry that other companies might not, our manufacturing processes and supply chains had better be up to speed. If we can’t deliver product timely and efficiently, relationships with new contacts would be damaged before our kit can even impress on site. We’re confident we can capitalise on this opportunity but the whole team must realise it’s not a case of sitting back and watching Wayne work his magic. Wayne is currently in the UK, where we’ve lined up more than a week of training, meetings and other activities to introduce him to life at Straightpoint. It has been uplifting and reassuring to listen to him talk about the impression of the company he had from the outside and how we are perceived in industry as being responsive to end users’ force measurement problems. That dynamism and flexibility, in addition to the existing breadth and quality of product, are unique selling points that Wayne is keen to work with. All things considered, we’re confident it’s going to be an interesting second half of the year. Follow us as it unfolds on Twitter—@LoadCell—and use the hashtags #loadcell and #belowthehook to engage.